Sometime before any concept of architecture existed, the primitive men painted animals on the walls and ceilings of the caves, something interpreted to be an act of invocation linked to admiration,  and its ultimate purpose would be the hunting of animals as a basic means of survival. This exhibition tries to stablish a correspondence between the experience of the cave and the Niemeyer dome, understanding its interior as a constructed cavern, having passed through the sieve and the high sophistication of culture that man has reached to. Imitation, with the actual technologies, that primitive act in order to propose a new model of invocation, one that no longer searches to capture the animal but an approach and understanding of its essential qualities and, finally, of the need of its existence. Imitation in order to review, in this case, our basic concept of survival regarding nature. Frequently present in prehistoric paintings, throughout history the deer acquires a strong symbolism, relating it with the tree-shape, the mystic of the light, and concepts of cyclical renovation. It has been connected, by authors such as Cirlot, to the Tree of Life because of the look-alike of its antlers with the branches of a tree and it’s also a symbol of the spirit for mystics such as San Juan de la Cruz. From ancient times the symbolic spectrum of the deer bridges the instinctive with the spiritual, earth and heaven, represented here by the overlapped concepts of carven and dome. Nowadays the deer is the most sacrificed animal in hunting where its value as a trophy is directly related to its beauty. 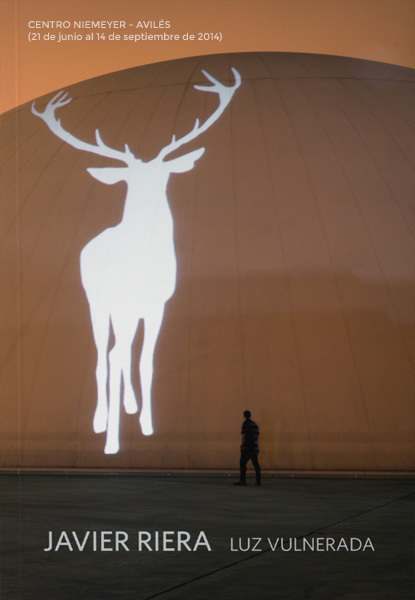 These deers walking around the dome acquire, with their special naturalness, the aspect of luminous entities, giving silent testimony of their slanted existence and the destruction of the natural environments around the planet, where in Brazil, Niemeyer’s place of origin, also means the destruction of the indigenous people, the actual primitive humans. This work aims to stablish a coherent dialogue between the building and the humanist profile of Niemeyer that firmly believed the possibility to improve the world through art, architecture and social commitment. The so called utopias of the 60’s perhaps failed in their putting into practice, but losing what these utopias meant was without a doubt our greatest fail. The ultimate purpose of this new invocation is, therefore, proposing to the viewer the need to review in depth our concept of survival in relation to nature that cannot longer be antagonistic. And in a spatial way our relation with the animal world, suppressed by hunting, to the destruction of its natural environment and to abuse and torture in the case of animals that turn into food for men, who will always be in debt with them. The studies regarding the perception of animals point to a kind of image thinking where the presence is a basic structural and dynamic element. This work also aims to approach our experience to theirs and at the same time bring up questions about the relation between invocation and presence. If one of the basic functions of language is naming the missing, invocation is the first cultural act, where desire, admiration and tragedy of the absence configure an action that culminates at the origin of image representation. Several studies regarding the prehistoric paintings seem to conclude that the primitive men depicted themselves as a being inferior to animals, admired by them. Apparently the development of conscience brought up a feeling of shame or blame about the loss of unity with nature that surely is found in the origin of the biblical myth of the original sin.